The planner chart has a 48x60 grid and it has labels. Decide on a scale and map in your garden or garden bed - use several grids for several garden beds if you need a more detailed plan. If you print more than one grid for each year, then label the planner chart by placing an identifier after the heading "Garden Plan" -- such as Garden Plan Bed 1a. Of course, step one will consist of several decisions that can't exist without the other and those are- Do you have a place for a garden? How big can it be? How big do you want it? How much time do you have? Where will it be located? Mark the spot, with string if the sides needs to be straight. As soon as the ground can be worked in early spring or late fall, turn it and break up the clods. Add about *one inch of compost and mix it in the top layer of soil. Rake it level. <-This is a very simplified way to prepare a garden and not the best way, but it's okay if you are a bit iffy about the whole gardening thing. The very best way to make a garden bed is to "double dig" the beds. I've done it; it's labor intensive. *It is possible to do this without adding a one inch layer of compost - so proceed without compost, this time, if you do not have it. Make a garden plan. Think about what plants you want to grow and find out how to grow them. Find out how far apart to plant them. I recommend going to the library and checking out the book: Square Foot Gardening by Mel Bartholomew. When it is warm enough to plant, set your plants in the prepared soil. Do not crowd your plants. <- This is very important. See the photograph (right) of the grape tomato plant? That is one plant and it is a normal sized tomato plant that when the photograph was taken had been in the ground for 2.5 months. See the cage in the photograph? My cages are made from concrete reinforcing wire. They are 5 feet tall and around 21 inches in diameter. They are perfect tomato cages. My husband made them the first year that I had my garden at our current location and that makes them over 20 years old. Five of my cages were flattened during the 4/27/11 tornados. [!] The cage bottoms have to be anchored with either dirt or metal hooks, otherwise, they will turn over when a gust of wind blows against your monstrously sized caged plants. Start a compost pile if you believe that you will want to continue gardening. The same year that you start your garden, be certain that you also start a compost pile so that you will have compost for next year's garden. Add mowed over leaves and grass clippings to your compost pile. Kitchen refuse like eggs shells, used tea leaves, coffee grounds, and vegetable peelings can be added to the pile. Throughout the summer, pull the weeds and harvest your produce as soon as it is ripe. Water the plants if there is a drought. Cucumbers, tomatoes, melons, some squash can be grown vertically. Fertilize with organic matter and your garden will do better overall. If you buy fertilizer, get it from a company that sells organic products. I buy products from Gardens Alive!. They have a website. Never use any chemical pesticides because they also kill natural predators. Research organic methods of pest-control. Start a compost pile and use it on your garden. If you have a big enough space, you might also like growing corn, pole beans, okra, and potatoes. You can ignore my advice, but please don't buy the giant tomato varieties-- the kind that claim that the slices are "big enough to cover a bun". I have one question for you - Do you want a better chance for an actual tomato crop or do you want 3 or 4 big ugly tomatoes that are cracked at the stem? That's what I thought. Giant pumpkins-- It's true you could grow one giant pumpkin -- as long as something doesn't kill it, but wouldn't it be better to grow several normal sized pumpkins? If you continue to garden, go ahead and try the giant pumpkin when you have the space for it. I've done it once. Giant sunflowers-- I have no problems with those. I have never tried them though; I get my sunflower seeds from the bag of bird seed. 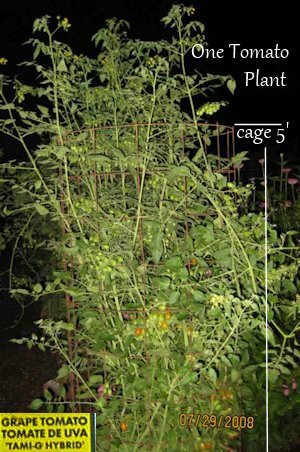 A Ramble about the Tomato: The size of your garden limits how much of what can be planted. For instance - a tomato that is grown vertically will require at least 3 feet of space. While you can put one tomato plant in a large planter, it needs "shoulder room." Seriously folks, don't put 5 tomato plants in one large pot and expect to get even one tomato. If you put one tomato plant in one large pot, and if you have several of these, don't line them up with the pots touching each other - space them. And if you put one tomato plant in a "square foot" plot - don't put anything significant within 18 inches of it in all directions - minimum, more room is better for the grandiose tomato. If you "pot" your tomatoes, consider getting the "bush" (determinate) type. They grow to a determined height, they are kind of bushy, and require less space that the "vine" (indeterminate) type. A healthy bush tomato will need support. It is a shame when a bush tomato starts producing and then splits off at the trunk for lack of support. - So, support the bush tomato, it might be short, but it is not sturdy. Not only that, a turtle might decide to climb your bush tomato (a turtle climbed my bush tomato plant), and his extra weight could break an unsupported plant.